Connect two Drobo units to your computer at the same time? One of my readers asked me a little more than a month ago if I could post some screenshots of the Drobo Dashboard with two Drobos connected at the same time. Sure, no problem. It’s easily doable, and the Dashboard software automatically differentiates between each of them and displays the proper stats for each, even if they’re name the same. I haven’t tried it yet, but you could probably connect three Drobos at the same time if you wanted to. Here’s what the drive icons look like on my MBP’s desktop. The main screen inside the Drobo Dashboard software will display buttons for each connected Drobo, allowing you to switch between them as needed. 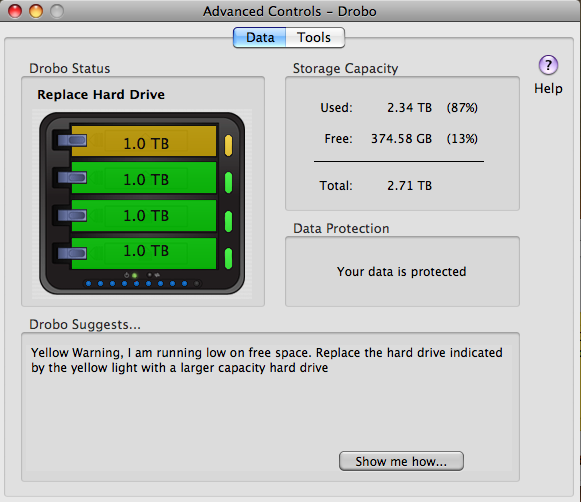 As you can see, I need to either free up some space on my main Drobo or get some new drives. Using the Drobolator, it turns out I’d need to get two new drives (either 1.5TB or 2TB each) in order to see any increase in the available space. The Advanced Controls screens inside the Drobo Dashboard show the drive layouts inside each Drobo. I’d like to point out a possible bug in the Drobo Dashboard software while I’m at this. As you can see on the following screenshot, when I click on the Check for Updates button to see if there’s a firmware upgrade for my Backup Drobo, which is a USB-only unit, I get a message which tells me both the Dashboard and the firmware are up to date, when I know that the firmware is out of date, as you can see from the firmware version itself. I’ve often had to perform manual firmware upgrades to my Drobos, because I keep getting this message in error. I hope this bug can be resolved at some point. 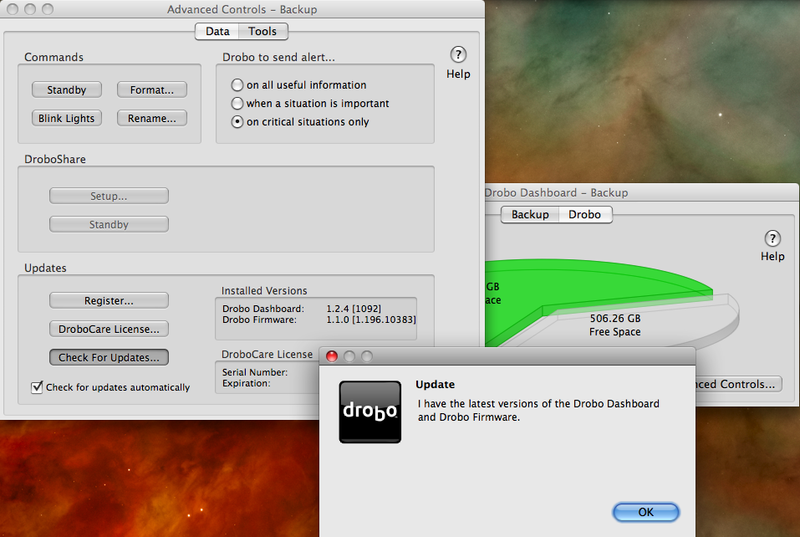 Other than that, the Drobo Dashboard software works as expected, and can work with multiple Drobo units as well. No problems there. Update: After doing a manual upgrade to firmware version 1.2.4, the automatic check for updates from within the Drobo Dashboard worked, and when my Drobo rebooted, I was prompted to upgrade to 1.3.0. After an initial unsuccesful attempt, I was able to upgrade just fine. One less item on my to-do list. Good. Previous Post I like "The Saint"
I am having a problem updating my Drobo Dashboard (v 1.2.4) and Drobo Firmware (v 1.3.0) to a newer version (v 1.5.0) and (v 1.3.1) respectively. I tried to download the Drobo Dashboard software from Data Robotics site but Mac OS X 10.5.7 could not mount the .dmg it is stating that it is not recognized. Tried the windows version no luck either. 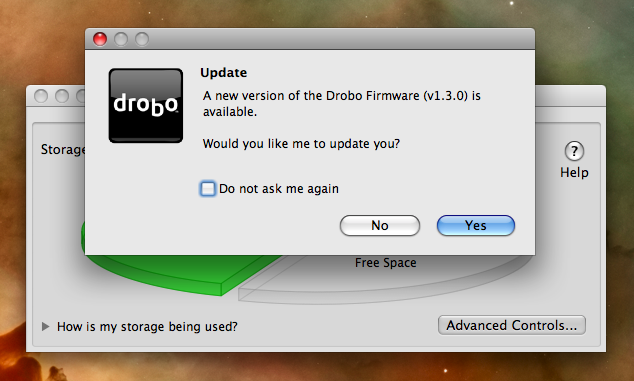 I have no idea how to update the Drobo Firmware as I did not find it on their site. Dan, the best thing in cases like yours is to contact Drobo Support. They can either point you to a proper download link for the firmware, or email it directly to you, and troubleshoot the firmware upgrade to see why it’s not completing. You’re welcome, Paul! I hope your Drobos keep working great for a long time to come!